Hah! You thought it was over, didn’t you? Well, good news, everyone! The pokerz never stops! More accurately, it takes a while for results to get posted at a number of venues. Eric Vallee of BC posted a late 8th place result in the Dailies, which were still getting a couple hundred players in the last couple days. 287 entries in this event. You can check out a graph of the prize pools for the entire series here. This was the last event of the series; the night before there was no 10pm, and on the 14th, the only Daily that ran was the 3pm. Andrea Christensen (BC) snagged 3rd place out of 125 entries. 2,251 entries pushed the prize pool nearly a million over the guarantee, with a top prize of $327K. The top PNW player was Dennis Walker of Oregon, who snagged $16.4K for 21st. Michael Nelson (WA) came in 40th, Himmaphoum “Nu” Bounthinh was 44th, and Laurie Swaney took 240th. Doubtless there were some BC players in there, but the Venetian just says “Canada” on the reports. Cherd Viroonphun of Oregon racked up his best-ever result on Hendon Mob with a 3-way tie for 2nd place in a 134-entry bounty tournament last Thursday. The prize pool was $15.1K with another $6.7K in bounties. Been jonesing to play under the PokerStars aegis once again? Always wanted to test your poker wits against people like Daniel Negreanu, Vanessa Selbst, and Chris Moneymaker but don’t have $10,000, $100,000. or $1,000,000? Well, if you’re willing to go a little distance, you’ve got a number of chances coming up, with the Californians for Responsible Poker PokerStars Pro Tour. Three events are already gone by, but each weekend through August 9th, there are from two to four events at California card rooms: Napa Valley and Colma in the Bay Area next weekend, Clovis (on the outskirts of Fresno) and Citrus Heights (Sacramento) the weekend after that, then four days straight in Delano, Rosamond (north and south of Bakersfield, respectively), Fresno, and Turlock. Featured PokerStarts Pros in addition to those named above are Jason Somerville and Liv Boree, It’s mix and match, but Negreanu’s scheduled to appear at five of the remaining eight venues; if you don’t get a seat next to him at the first you can keep stalking him! Links are in the Calendar, you can get more info at (most) of the casino sites linked from the tour page, though a few of them are a little delinquent about putting up any info. Space is sure to be limited, so call ahead and make sure you can get a spot before you drive all the way down. Check out pictures from this weekend’s events @iPoker4CA and @PSProTour! Each day of the World Series of Poker Main Even is a struggle. Not simply a struggle to not fall behind, but a fight to build from your starting stack of 30,000 chips to (ideally) something like 20 million, 666 times what you began with (there’s a coincidence for you). Ideally, by the end of each of the seven days of play before the final table is set, you’ll multiply your stack by about 2.53 times (2.537 = 663.5) or more. That’s not a necessity—not everyone has a steady rise to the top—but if you were able to maintain that rate of growth, you would reach the million-dollar payout level. This is how the 2015 November Nine fared on their path to poker’s biggest stage. Each of the days of the Main Event play five 2-hour levels. By the end of every other day, the blinds increase by a factor of 10. On Day 1, everyone begins with 30,000 chips at the 50-100 blind level and ends at 200-400 with a 50 ante. There were 6,240 entries over three days, with a total of 3,919 surviving their respective days. One way to gauge how players are doing is to compare their stacks to the average stack, which was 47,767 beginning Day 2, but another method is to look at the median stack, where half the players have more chips and half have less. For this year’s Main Event, that was 38,575, when you combine all three days. By either standard, four of the November Nine were above the line after Day 1, though only two had increased their stack to 2.5 times the start. Patrick Chan and Pierre Neuville kicked things off with excellent Day 1 totals of 81,900 and 79,625, respectively. Joshua Beckley (62,200) and Federico Butteroni (52,650) were the other two in the upper half of all players. Current chip monster Joseph McKeehan, Zvi Stern, and Neil Blumenfield were all within the 30,000 to 40,000 range. Max Steinberg was actually a bit below the starting stack, at 26,300. Note: Thomas Cannuli does not appear on any of the Day 1 reports, his first mention is in the results for the combined Day 2s. Neuville is the only November Niner known to have started on Day 1A. Stern and Blumenfield played Day 1B. A player who increased their stack by 2.53 times to 75,900 on Day 1 would go from playing 300 big blinds to 190. On Day 2, the cost of poker at a full table goes from 1,050 chips in Level 5 (the end of Day 1) to 3,600 in Level 10 (the end of Day 2). By then, the median stack among the 1,796 players (just under 29% of the entrants) was 92,000, with the average at 104,231. As the field prepared to combine for the first time, only Beckley and Chan were below median, with Chan actually having lost some ground during Day 2C and dropping to 66,800. The others ranged from Blumenfield’s 149,500 to Pierre Neuville, with more than 350,000. At this point, most of the 2015 November Nine had more than twice the median stack, but even Chan had 40 big blinds going into Day 3. The new payout structure of the Main Event made Day 3 “Bubble Day”. More than half the players going into the day would be paid at least the minimum cash of $15,000. By day’s end, the 661 remaining players would be facing 2,000-4,000 blinds and antes of 500; at 10,500 chips per round, a cost exactly ten times that of the end of Day 1. Federico Butteroni took a hit on Day 3, not only dropping what would be the new median of 238,000 but actually going from more than 200,000 chips to 125,500. All the other players beat the median, with most ranging between Zvi Stern’s 256,000 and Max Steinberg’s 616,500. The breakout, however, was Joseph McKeehan, who would move to second in chips on the leaderboard and stay near there all but one of the remaining days, as one of the first players to break 1,000,000 chips. From 10,500 chips/round of the end of Day 3, the cost would rise to 36,000/round by the end of Day 4 (10x the cost at the end of Day 2). It would be the first and only day that all of the eventual November Nine would be above the median (by definition, at the end, half of them would be below median). McKeehan would lead not just the Nine, but the entire field by the end of the day, nearly tripling his total to 3.122 million. Cannuli would be the nearest competitor of the nine, placing 5th overall with 2.271 million. The median for the day was 700,000, Blumenfield, Neuville, and Chan were all between that number and 1 million. The others were spread between the 1 million and 2 million marks. Only 237 players would be coming back for Day 5. Another ten-fold jump over two days meant that by the end of Day 5, fold a round would lose you 105,000 chips (blinds of 20,000-40,000, antes 5,000). Correspondingly, about 10% of the 661 players ending Day 3 would remain: just 69 (nearly one for every year of Day 5 chip leader Pierre Neuville’s age). Neuville rocketed from 956,000 to 7.105 million over the course of the day. Neil Blumenfield had a rough day, dropping from 835,000 to 570,000. It put him in next-to-last place on the chip count at the end. McKeehan (3.66 million) dropped to 20th in chips, temporarily passed up by Steinberg (4.285 million), Stern (4.415 million), and Cannuli (5.07 million). Median stack was 2.4 million, with only Blumenfield, Beckley, and Chan below that number. Neil Blumenfield was coming in to a 10bb stack on Day 6, but he doubled through Brian Hastings half-an-hour into the day, then did it again an hour later, after which he was comfortably sitting on more than 40 big blinds, though he was still below the median at the end of Day 5. McKeehan, meanwhile, worked his way back to the 4th-place position out of 27 by the end of the day, with 11.975 million once again ahead of the other eventual Nine. With him above the median stack (6.21 million) were Stern (8th, 9.94 million), Chan (11th, 7.4 million), and Cannuli (6.22 million). Neuville was just under (15th, 6 million), followed by Butteroni (18th, 4.98 million), Blumenfield (20th, 4.315 million, a 650% increase over where he began the day), Beckley (22nd, 3.745 million), and Steinberg (24th, 3.29 million). This would be the only day where most of the final Nine would be below median (which also means that most of the players above the line didn’t make it through the next day). The last day for everyone but the Nine. The day had no set end apart from the elimination of 18 players. As it happens, that point was during the fifth level played. By the time the tournament reached level 35, there were only eleven players remaining (yeah, that guy was the eleventh player). Nearly two hours of play went by, with Joe McKeehan fast-driving action on Daniel Negreanu’s shorter-handed five-player table before Jack Effel enforced hand-for-hand play. The end for Negreanu came only about fifteen minutes later (will anyone remember the name of the guy who laster longer than Negreanu but still didn’t make the November Nine: it’s Alex Turyansky). Most of the November Nine players multiplied their stack several times on Day 7, with Butteroni only increasing by about 25% and Chan actually going down by more than a million chips. The median stack when they return four months from now will be the stack of Max Steinberg, at 20.2 million, not quite ten times the median stack at the end of Day 5. For more about the November Nine, check out Donnie Peters’s article at PokerNews. Pocket kings were the downfall for both of the final two Pacific Northwest players (both from British Columbia) in the World Series of Poker Main Event on Day 6. Just in different ways. Not long after that, Matt Jarvis lost 2.4M—more than half his chips—in a hand against Josh Beckley. Two hours later, he lost another million in a three-way hand with Beckley and Patrick Chan, who triples up. Jarvis was left with just 18BB. It was only about half an hour later that his four-bet shove with Q♠Q♣ ran into K♣K♥ in the hands of Bob Buckenmayer, cutting short his opportunity to make a second November Nine. He took home $137,300 for 51st place. And that’s the end of my daily WSOP coverage for the season. Thanks to everyone who’s checked in regularly or even occasionally. It’s been a fun grind in its own way, and I’ve enjoyed meeting people who’ve been reading the updates, both here and in Las Vegas. I want to take a second to mention the Pacific NW Tournament Calendar link on the masthead above, I try to keep up the list of events and series that might be worth a drive or flight from Portland. The Wildhorse Summer Poker Rodeo starts up tomorrow in Pendleton; it’s not on the scale of the spring or fall events, but last year’s $300 NLHE Saturday event had a prize pool of $80K. There’s an Ante Up Poker Tour event at Thunder Valley outside Sacramento starting next Monday with 20 events over two weeks, including $200K guarantee $425 NLHE and $250K guarantee $1,650 NLHE events, plus PLO, HORSE, and even an Open Face Chinese Pineapple tournament. And further south in Los ANgeles, the Bicycle Casino starts the WPT Legends of Poker a week from today, with the Mega Millions XIII and a $3,700 NLHE WPT Main Event, running through early September. Thanks again to everyone who’s been following the blog! Tai Nguyen was the last PNW player to get knocked out on Day 5, in a multi-way pot in the last hour of the day. Matt Jarvis and Jonas Mackoff (both BC) are the remaining PNW players among the 69 players moving to Day 6. Mackoff is in 28th place, with 3.035M. Jarvis is in 7th place, with 5.25M. Blinds to start the day will be 25K/50K with a 5K ante; despite a trend to younger players in recent years, the chip leader is 72-year-old Pierre Neuville, the Belgian former CEO of the Hasbro game company’s European operations. Other PNW players who cashed on Day 5 were Tommy Hang, Vivek Rajkumar, Terik Brown, Cole Jackson, Shahriar Fahim, and Noah Merritt. Play today should bring the field down to 27. Then Wednesday’s action will set the November Nine for the 2015 Main Event. 181 ? 184 Terik Brown WA 382,000 ? Still $14.1K up top for the $235, even with only 316 entries. Carl Oman of Vancouver, WA took 22nd. There are Daily Deepstacks at the WSOP through the 14th. The Venetian Deepstack Extravaganza has the second of three entry days to a $2M guarantee NLHE event ($5K buy-in), with a $600 satellite tonight. Today at Bellagio is a $2,140 NLHE Seniors tournament. There are only 237 of the original 6,420 entries into the Main Event remaining, just 3.7% of everyone who entered. However, there are 8 9 of 150 (yes, not 149!) Pacific Northwest players left. Okay, that’s just 5.3% 6%, but that’s actually 2 three whole players more than the statistical average (well, two three-and-a-half, but the only half player in the Northwest is yours truly). The ringer in the field has been Binh “Jimmy” Nguyen, who was confused in the official reports as a Vegas pro with the same name. He finally got recognition when he placed 437th for $21.8K. He’d nearly doubled his stack on Day 1C, then ended Days 2C and 3 with virtually the same number of chips, until he shot up to over a quarter-million chips on Day 4. He made it through three payout levels, and nearly cleared a fourth before busting and claiming his fourth cash of the series. The players remaining in Day 5 are still at the $34K payout level. Payouts over $100K don’t begin until 63rd place. 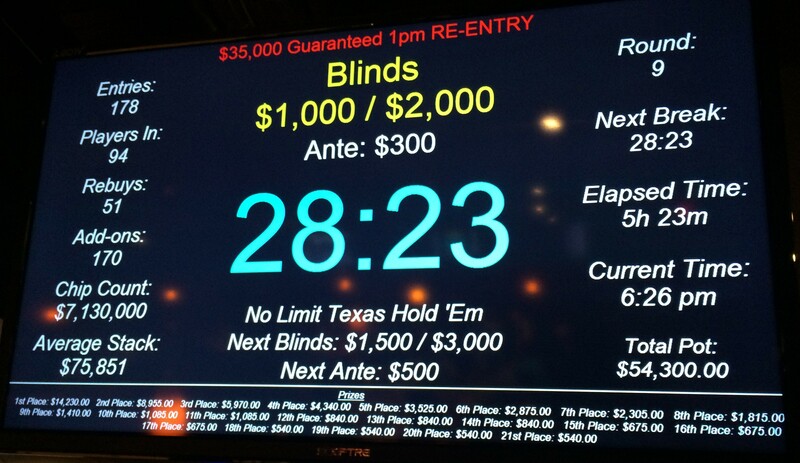 Blinds in the first level of Day 5 will be 8K/16K with an ante of 2K. UPDATED: Two eliminations as of 1:40pm. Tommy Hang and Vivek Rajkumar. It was Hang’s third cash of the series and Rajkumar’s only cash. UPDATE: [3:15pm] Two more down. Cole Jackson and Terik Brown. Number 4 this year for Cole (including just missing a bracelet in Event #22), and the solo for Terik. UPDATE: [5:00pm] Shahriar Fahim is out in 155th place. Meanwhile PNW players Jonas Mackoff and Noah Merritt tangle. UPDATE: [8:00pm] Players are on dinner break. Noah Merritt is out in 132nd place. NOTE: The official report for the end of day 4 did not include Terik Brown, so his rank and chip count at the end of the day are not included in the table below and he wasn’t included in the original version of this report. Mark Daniel Hughes of BC cashed yet again this summer, placing 30th in a 372-entry field. The Venetian Deepstack Extravaganza has the first of three entry days to a $2M guarantee NLHE event ($5K buy-in), with a $600 satellites tonight. Tomorrow at Bellagio is a $2,140 NLHE Seniors tournament. If you haven’t seen them already, check out my PokerNews story on the ages of final table players at the Main Event, and my write-up of my evening playing poker with Oregon poker phenom Angela Jordison at the Encore $35K last night (she went on to take second place; I went out in the middle of the field, natch). Day 4 was playing out down in Las Vegas, most of the Portland poker crowd was back home and Encore scheduled one of their large-guarantee games. A slightly different format than usual, with re-entry instead of a re-buy (or worse, a live re-buy) and with the re-entry through the break after the sixth level instead of level 3 or 4. That meant five hours of re-rentry, with the ability to come in with 35K in chips at the 600/1200/200 level. I picked up a couple small pots early, then got JxJx and had to fire a c-bet at a king-high flop to win that, then got KxKx with four callers and an ace on the flop, so that got check-folded on the flop. I picked up a couple more small pots, got JxJx twice more, thenproceeded to fold my way down from 30K to 13K as every hand I was involved in just never improved. I spent my entire tournament sitting to the left of a poker celebrity, Angela Jordison—the winner of the first three events at the 2015 Wildhorse Spring Poker Round-Up—so I got an up-close and personal look at how she accumulates chips. Obviously, I didn’t figure it out, because I was out of the tournament after five-and-a-half hours. She did get lucky early on, about a half-hour into the game when she called an all-in for most of her chips with top set against against my friend Sean Gentry’s made straight after the flop, and having the board pair on the river to give her the full house. She put the hammer down enough that by the time a short- stack on my left went all-in from the small blind with about 10K over her cutoff raise, his rivered trips with 9x7x against her AxAx just put a small dent in her stack. I picked off a couple pots she was involved in. An aggressive player in seat 10 (I was in 6) raised a pot on my big blind to 5K, Angela was the only caller ahead of me in the small, and I called about a quarter of my stack at the time holding 6♣5♣. The flop was A♣K♣6♦ and when Angela checked, I shoved. They both folded and I just about doubled up. To two-thirds the starting stack. Another hand was with both of us in the blinds and it was checked to Angela. She raised and I shoved with QxJx, figuring she had an ace but probably a kicker under both my cards. She considered it briefly, showed the A♠ and asked if it worried me. Since I was pretty sure she had an ace when I shoved, I said no. In the end, I got mega-cooled. Q♦Q♥ in the big blind, I had less than 10BB, seat 1 opens to 2BB and I shove. He has AxAx, there are three diamonds to a flush on the turn (including A♦) and the river brings quad aces. A couple of regrettable hands. I opened with 4x4x at one point then laid down what would have been the best hand after a flop of Ax3x3x. The 4x came on the turn after the guys with aces went to war and AxQx lost to a worse ace. And I folded KxQx under the gun when I was at about 15BB because I didn’t want to have to go to war with it against a number of larger stacks. That hand was won by 2x2x when the other player involved failed to pair any of the five cards (including an ace and a king) on the board. Still, I think I played decently. Had a nice chat with Angela (who was aware of the WSOP updates), and whiled away a few hours when I could have been sorting papers in my office. Five-and-a-half hours. 95th of 229 entries. My latest article for PokerNews is online, with an interactive graph showing the ages of the final table players over the past ten years. 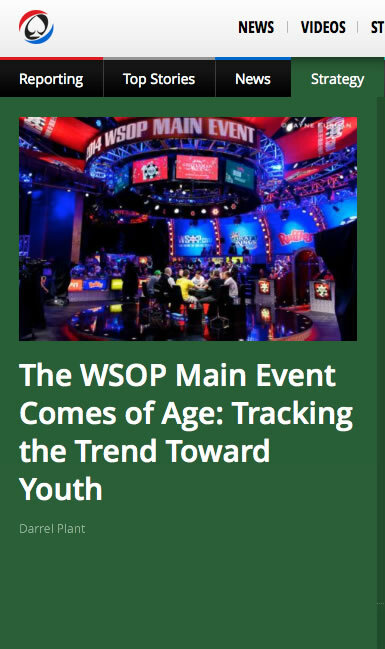 It’s been percolating for a week or so—there hasn’t exactly been a dearth of WSOP-related content—and editor Martin Harris added in some material that tied it into other articles. Really better than anything I could have written on my own. But the graph! Adam Croffut (WA) got 13th for a min-cash, in a field of 136. The players picked back up a little after the first days of the Main Event, though not to what they were at the height of the series (see my chart of Deepstack prize pools for the summer). Dustin Centanni—currently in Day 4 of the Main Event used his day off before Day 2 to bring some extra money back to BC by taking 13th out of 577 entries. Monte George (WA) and Sean McMahon (OR) got 20th and 25th, with Robert Mitchell (OR) coming in 42nd. Brenda Dewitt of Washington took 5th place in the field of 110. Stephen Burgermeister of BC was the top PNW finisher in this field of 497, taking 5th. WA’s Alan Snow just missed the final table at 13th. The players hit the money around 10pm, with play going hand-for-hand with 1,002 remaining and lasting just a couple hands before the bubble broke. 1,796 players were ground down to 661 by the end of play, with the first jump from the minimum $15K payout coming for player 648 sometime early in Day 4. 33 of the 59 (known) PNW players hit the rail before the bubble, and five cashed at the $15K payout level, leaving just 21 (maybe 22) going into Day 4. That’s 14% of the original field of PNW players, with just over 10% of all players remaining. Not a bad representation. Vancouver, Washington’s Noah Merritt is sitting on the median chip stack for the entire field, which is actually lower than the median for Northwest players (300K). Matt Jarvis (BC) and Trevor Vanderveen (WA) are in the top 10% of stacks. It was a great day for Washington players whose first name started with ‘T’, all of them who were in Day 3 made it through to Day 4; congratulations Trevor, Terik, Tai, and Tommy! 250 entries blew this up to a prize pool of $64.8K. Homan Mohammadi of BC took first place in a chop that awarded him $14K, with Paul Myers of WA and three other players getting $6.7K. The Venetian Deepstack Extravaganza continues through July 19th. The $2M guarantee NLHE event ($5K buy-in) starts tomorrow, there are two $600 satellites today. The Wynn Summer Classic has its last $300 NLHE $25K guarantee today. 1,142 players made it through the five levels played on Day 2C, and they will combine with the 654 from 2A and 2B into Day 3 of the Main, where—because of the payouts being extended down to 1,000 places—people will hit the rail with an extra $5K in their pockets today. These are the 59 Pacific Northwest players remaining in the field. Five players, including Portland’s George Wolff, are in the top 100. That may not sound like much, but that is the top 5% of all remaining players, and that’s a good thing. Median stack for the field overall is 92K, for the PNW contingent it’s 84K. For brevity’s sake, this copy of the table will only have Day 2 finishers on it, you can refer to yesterday’s post for the full list. There was a Jason Mann from Burnaby, BC on both the Day 1A and Day 1B results, with different chip counts; whatever the mixup, there is only one Jason Mann. Michael Corson of WA wasn’t on the earlier reports but he’s there in start of Day 3 figures, so he’s on the list. Chad Wassmuth probably has more than 1 chip, but they may not have been able to read the number. Randy Chow of BC was changed to Ricky Chow of BC. I have a third-party report that there is another Oregon player whose name is mixed up with a Vegas pro—who’s going to be sitting next to 2011 Main Event runner-up Martin Stazko today—but until it’s in the reports, I’m just going to leave it at that.